Friends of the Earth International’s School of Sustainability provides political education around the world. 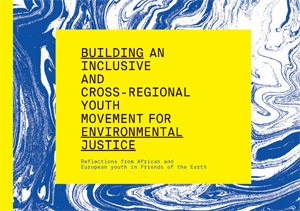 From the Environmental Justice School in South Africa and community leader training in Sustainability Villages across Uganda, to youth summer camps in Colombia, Europe and Asia Pacific, the federation is engaged in a range of diverse forms of political education to empower people to mobilize, resist and transform societies and create a just world. School of Sustainability comes from “Escuela de la Sustentabilidad”, a regional learning event first organised by Friends of the Earth Latin America and the Caribbean (ATALC) in 2007. This escuela brings together Friends of the Earth groups and allies in the region to share and develop a critical consciousness on the drivers of social injustice and environmental destruction, inspired by popular education. The term school is not used literally to mean an institution, but rather a process of learning taking place in a variety of places and in non didactic, nontraditional and nonhierarchical ways. Friends of the Earth International works in 4 main regions, Latin America and the Caribbean, Asia Pacific, Africa and Europe. Each region organises an at least one annual School of Sustainability, that is hosted by a different Friends of the Earth group each year. Friends of the Earth member groups and allies from the region are invited. The themes and objectives of each school change to accommodate the needs of the groups and region. The key theme of every school is to share and deepen our collective and political understanding of the root causes of social and environmental injustice. The program covers skills in taking action, inspiring stories of solutions and successes as well as creative, artistic, spiritual and musical expression, to create a space for hearts and hands as well as minds. Popular Education principles and methodologies are an important part of the programs. Friends of the Earth International runs an exchange programme for staff and activists within the federation. The topics of the exchanges are widespread and diverse, and are designed to facilitate campaigning on common resistance targets or on an exchange of learning and practice between groups and regions. They build stronger links and solidarity across the federation. Currently, our exchange programme is focused on youth and strengthening intergenerational learning in Friends of the Earth International. Here are some highlights of what has been happening between fourteen of our groups in Europe and Africa, in the largest scale cross regional exchange programme Friends of the Earth International has ever facilitated. Young people from Friends of the Earth Africa and Europe have been working together for two years, exchanging skills and knowledge and building cross-regional solidarity for environmental justice. Here's an insight into who they are, what they've learnt and what they're doing now. Through a series of exchanges that took place over two years, youth from seven Africa and seven European (Young) Friends of the Earth groups explored what solidarity is and how we can practice true international solidarity. This zine is a collection of conversations, learnings and tools gathered from youth in Friends of the Earth in Africa and Europe. The voices featured are from those who participated in the Africa-Europe youth exchange that took place between 2016 and 2018. The publication includes some of the tools we used during our workshops to enable us to learn from and with each other, which were inspired by popular education methodologies.